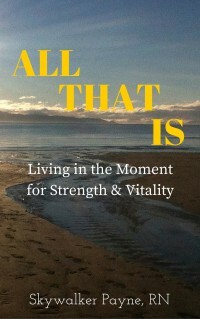 Over the past few months I’ve shared my process of writing this book, All That Is, Living in the Moment for Strength & Vitality. I began with the Value of a Daily Writing Habit, and continued with Writing a Book – Step 2 – First Revision,Writing A Book- Step 3 – Editorial Advice. In Step 4, my manuscript became a book. I began making the revisions my developmental editor suggested. As I revised and re-read the manuscript I saw my life stories, not directly related to mindfulness, gratitude and health, weakened the book’s purpose. Not only did I now have to rewrite, revise, and edit, I needed to make carefully measured chapter cuts. Taking out the unrelated chapters significantly reduced the length of the book, necessitating expanding and adding chapters. Rewriting was a slower process than the original writing because I had to stick to my theme of living in the moment. In this process I made the decision it is better to have a smaller book than one padded with information that doesn’t contribute to the book’s intention. This process took longer than expected because I edit as I write. Now,the talented writer, Gary White, is reading my fully revised, rewritten, and re-edited book. He has graciously agreed to write the forward. While I wait, I am completing the Resources chapter and designing covers. The above cover is the first of several I’ll be creating to receive your feedback. I’m using Kindle e-book cover templates from Canva. To be sure you don’t miss out on any new works, please register. Just click the link below and fill out the registration form. Thanks. Very helpful advise, Skywalker 🙂 It is hard to cut, but I agree that it does make sense to be mindful of your purpose. Congratulations on completing this challenging process! I look forward to reading the result of your hard work. Thanks for your continued support, Carol. Cutting whole chapters– or sequences– is difficult to do after you’ve worked so hard on them. Congrats on understanding that they distracted from your theme & realizing a leaner book can still serve you well. And getting a writer you respect to write your foreword must be really satisfying, too! Thanks, Dale. You’re right on everything you said. But, don’t worry what I cut will be used in another book. I don’t know how you felt when you realised you had to scrap a few chapters and rewrite. But I felt pain for you. Just when you thought you had completed the book to come to that realisation. I would have been floored for a couple of days to say the least. I admire you gaining perspective and reshaping your book. And I suppose that is what a writer does, acknowledges where they steer off track and continue. While the process sounds remarkable, it certainly has moments where it would take your breathe away with shock. I enjoyed reading your journey. Rachel, I know that cutting is part of the process. ANd with this book with the initial writing I had set a goal of 1,000 words a day and didn’t have a clear plan, so it was good to write as much as I did. And nothing is ever lost. Since I’m writing from my life, I just save the cut pieces to be used in other work another time. Thanks for reading and sharing your thoughts.